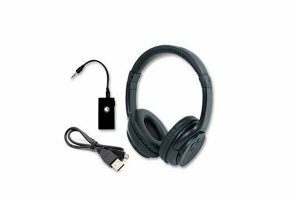 Own Zone Wireless Headphones Reviews - Is it a Scam or Legit? The Own Zone is designed to help you create a personalized audio experience without bothering others around you thanks to its wireless functionality. Claiming to allow for undisturbed TV watching at any volume, the Own Zone is a wireless TV headphone system from Sharper Image. The product promises to connect to virtually any TV in just seconds, giving you access to state-of-the-art noise canceling technology using a fully adjustable headphone design. We aren’t shown how they are actually powered, though it looks as though a USB charging cable is included. We tried reaching out to customer service, but after speaking with several representatives, none of them were able to confirm that this was the case. The product’s commercial illustrates the Own Zone being used in situations where one user doesn’t want to disturb others, such as when lying in bed at night or when everyone is congregated in the living room. It also portrays people using the headphones while walking around the house, and even while mowing the lawn. To accomplish those last scenarios, the transmitter that plugs into the back of your TV is stated to have a 100-foot range. The headphones themselves receive full stereo sound, and you can even turn the volume up and down using controls located on the side of the right earpiece. At first glance, these may sound like a compelling set of features, especially if you find yourself frequently competing for volume with others who share the same living space, but is this truly what you can expect from the Own Zone? Will the Own Zone Allow You to Enjoy TV as Loud as You Want Without Disturbing Others? This is the central claim made by the makers of the Own Zone, and as such, we felt it was appropriate to dedicate a brief section to it in order to help you decide if the product is right for your needs. Without having tested the headphones out ourselves, here’s what we know. Based on the information presented in the commercial and on the product’s website, it looks as though it might potentially be able to deliver on this claim for many users, allowing you to plug in and have your own zone of sound to retreat into with disturbing your friends and loved ones. That said, we have a few thoughts about how well it’s able to work in a variety of settings. For instance, though the manufacturer claims that the product can work on virtually any TV, it looks as though it connects using a standard 3.5mm auxiliary audio cable. Though it is definitely common for modern TV’s to have this output, many models do not. You can always purchase an adapter that will allow you to plug into an analog audio (red and white) output, but this will come at an added expense. Despite this concern, it seems as though the Own Zone should be able to deliver a personalized audio environment as shown in the product’s commercial, as it is able to provide you with audio while giving everyone else a break from the commotion in the process. The headphones also feature noise-canceling technology, which means that they can cancel out ambient sounds in the room you are in, hopefully leading to clearer and more present audio. Of course, the exact quality of that audio is really where this discussion is leading to (more on this in the head-to-head section below). Customer service was also unable to verify the specific type of noise cancellation going on with the Own Zone, as they perform differently in various situations. For example, active noise control (ANC) requires power and can drain the battery at a faster rate, while passive control does not need power, but may not be as effective at truly isolating the listening environment. The double offer will get you two Own Zone headphones and two transmitters with their associated cables. As for the return policy, the terms lay out that each order has a 90-day risk free money back guarantee. To initiate a return, you’ll need to call customer service at (833) 559-3369 to request an RMA number. Return shipping is covered by the manufacturer. As we mentioned earlier, the Own Zone certainly appears to be able to deliver on its main claim thanks to its wireless functionality and customizable volume control, but the real question becomes how well it can do so compared to the competition. Based on our experience reporting on and using similar products in the audio industry, we’ve found that it is very common to “get what you pay for” when it comes to headphones. For instance, searching for “wireless TV headphones” on Amazon or Google brings up thousands of different results, many of which share similar features to the Own Zone. That said, the pricing varies widely, with products offered anywhere from around $30 to $300 and up. If we’re ultimately just talking about headphones that let you listen to your TV discretely here, what’s with the huge difference in price? On the whole, the pricing for these products is largely determined by three main factors; feature set, range, and audio quality. Let’s break each one of these down in an effort to help you decide which product is right for your needs. Looking online, there are a large variety of wireless TV headphones available today. Most are “over-ear” options like the Own Zone, but a few products like the Simolio wireless TV headphones are in-ear buds instead. If you aren’t sure which style you prefer, it may be best to try out a few at a nearby brick and mortar electronics store, or borrow a pair or two from a friend or family member. In addition, several products we encountered had the ability to connect two headphones at one time to the same TV for mutual listening. Though customer service was unable to confirm for us whether or not the Own Zone could accomplish this, it is heavily advertised on headphones with the capability. In our opinion and experience, this makes it fairly likely that the product in question doesn’t include this particular feature. There are also several other features that may factor into your buying decision depending upon your personal preferences, including volume controls, noise cancellation type (as discussed above), and battery capacity. Range is a crucial factor for many, but it is also misunderstood in many cases. Most wireless technology has a limited ability to pass through thick solid objects like walls, resulting in diminished audio quality and even intermittent cutouts at times, depending upon the power of the transceiver. On Amazon, we encountered several products that claimed ranges of up to three times as high as the Own Zone, such as the Sennheiser RS120 at 300 ft. The quality of the transmitter also can directly affect how stable the incoming signal is, even from a short distance. This is definitely one of the leading causes of the price variation seen online, and unfortunately, it’s one of the hardest aspects to judge, for obvious reasons. Good sound can also be subjective, making it even more difficult to determine which product is best for you without trying it beforehand. If good sound quality is not a priority, you may want to focus on products that are priced on the lower end of the spectrum. If you are looking for a superb listening experience, however, it makes sense to go a bit slower, reading through reviews of popular products and even trying them out for yourself. Ultimately, the latter may be the best route to take when trying to find the headphones that are perfectly suited for you. The Bottom Line: Is Own Zone Right for You? Based on everything that we’ve learned about the Own Zone, can you truly expect it to provide the ability to listen to the TV at any volume without disturbing anyone around you? According to the information provided by the manufacturer, the answer is likely yes. That said, without knowing what specific type of noise cancellation is in use, we could envision a scenario where listening to audio loudly while in close proximity to someone else in a quiet space (such as in bed with your partner at night) might prove to still be disturbing to them. Of course, without having tested the product ourselves, we can’t state that this is the case in practice. Nonetheless, we feel it’s important to consider. In addition, we aren’t told how long the battery is expected to last, or even how it can be charged (though we think it uses the included USB charging cable). Put in context with several well-documented, highly reviewed & similarly priced alternatives online, as consumers ourselves, we’d feel hesitant to make a hasty purchase without first knowing a bit more about what the Own Zone truly has to offer. If you’d like to go ahead and try the product out, just be sure to keep the 90-day return policy in mind throughout your experience. If you find that the product isn’t right for you in the end, you’ll be able to return it, as long as you’re willing to part ways with a bit of change for the initial shipping & handling fees. Wow! You guys should be absolutely ashamed of your reviews! I have had my 2 sets for approximately 6 months. We have used them about 6 times and one port is already broken. Junk, junk, junk. Should have bought the Bose! Talked with customer service and they do not care about customer satisfaction. They even lied and said they really have no complaints on the port. Hah! The reviews say different. For anyone who has invested in this garbage and can't return it Amazon has a universal port for about $20.00. Still have to learn to quit getting scammed by these junk retailers! Can only hope the other port keeps working and the headphones don't fail. Shocks me that they carry the Sharper Image label! Disgusted! Junk junk junk! I received these as a gift. I was excited to use them but once I connected them all I heard was loud static. I tried connecting them to multiple TVs and it didn’t work. I contacted customer service and the guy instantly knew what I was talking about and said there’s nothing they can do for me. Seriously?! I’d give it negative stars if I could. After using the Own Zone now for at least 4 months, I one day put the charger cord into the port and it fell inside of the headphones, which means I can no longer charge the headphones and it defeats the purpose of the purchase. And having no address or phone number to see if I can get a replacement leaves me hopeless. They work great, but if a problem arises, you're on your own...not good! I could never get the system to work correctly, it never seemed to pair with the base. And, of course, there is no customer service to troubleshoot the system. What a piece of junk. Don't buy this thing. I purchased two Own Zone sets that were being closed out by the retailer. One of the headsets has bad static on the right side and is essentially useless. The sets were on close-out and the retailer does not offer a refund or exchange. I contacted Own Zone and was informed that "There is nothing we can do." This based on the fact that the item was sold as a closeout. His comment to me was essentially; You paid a reduced price so we won't do anything to help you. Must say that the other set purchased works very well and am happy with its performance. I do remember when Sharper Image was a respected brand and line of higher-end gadgets and devices. It is sad to see that this is no longer the case. Truly disappointed in the lack of customer and warranty support. Will not purchase Sharper Image branded items again, based solely on the very poor customer service. I got this for my dad for Xmas. Forty days later they don't work. The Sharper Image doesn't want to help. Target (where I bought them) won't take them back because it's past 30 days, and I have an expensive paperweight. I ordered these headphones from Target and received them in 24 hours. My 70-year-old mother loves them and now my dad wants a pair. The sound is phenomenal! She can hear the TV so much better. I will be getting my dad a pair, and maybe one for me! I was given a phone number to request a return and refund, but nothing on that line allows for that service. Then I found another line on this site and again was unable to reach anyone even though I called within the specified times listed. I am trying to find out how I can get an authorization to return these headphones (I have two of them and am not interested in keeping them). I got our Own Zone headphones and the problem with them is that if you stream TV, which I know lots of people are going to, that it knocks out your internet. There is no fix to this according to the customer service person I spoke with today. I am sending them back and will post how my experience goes with customer service and getting a refund. I think they need to let people know it will not work if you stream TV! I bought two earphones. I only opened one box so far. I will definitely have to open the second box and hope the product does not have any problems. The first product's earphone "on/off" button broke after 4-5 uses. The product is light in weight and immediately brings to mind - cheaply made. However, the lightness is appreciated wearing the earphones. Overall rating: 2. Instructions did not have a phone number listed, only email address. Packaging label was not included in the package. I had to contact billing statement to obtain phone number. Thank heavens American Express lists companies' names and phone numbers on statement. I love these headphones. I am able to watch TV without disturbing hubby’s sleep. They work 100% better than any headphones I have bought before. They are well worth the $59.99 price. Write a Review for Own Zone!